Hello all, I had a wonderful stamping retreat with my girlfriends this weekend and got to make some really fun projects! 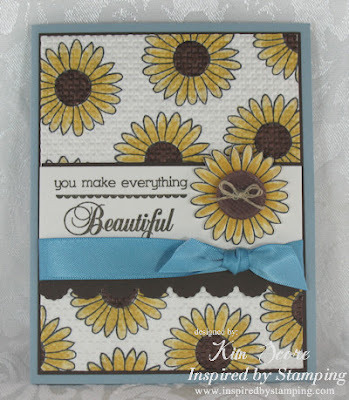 I finally got around to checking my emails and was shocked to see that my Inspired by Stamping Challenge card got lost in blogland! I scheduled my card to post on Thursday and it never happened! So sorry for being behind the 8-ball on this! The challenge was a color inspiration challenge. I saw this pretty picture and instantly knew I wanted to use the IBS Daisies set. Here is what I came up with. I love the look of stamping your own background and then embossing with an embossing folder. I used the SU! Lattice embossing folder. Thanks for checking out my card. To see the other beautiful creations, please visit the IBS Challenge Blog HERE.